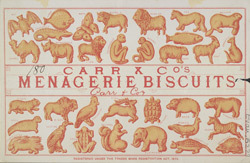 This is an advertisement for Carr and Company's biscuits. Before the 19th century, biscuits were carried on board ships and eaten by sailors as substitute for bread because they stayed fresh and did not dry up. Many bakers produced small batches of biscuits but they saw these as a sideline to their main bread making businesses and there were no large biscuit manufacturing companies. In the mid 19th century machines were developed that could be used to make the production of biscuits faster and easier. Mixing and cutting machines speeded up the process and enabled manufacturers to produce biscuits with appealing shapes and flavours.